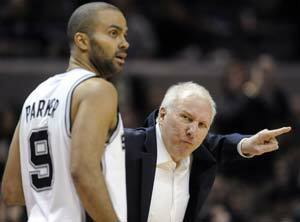 Tony Parker scored 28 points as San Antonio beat Utah to win their playoff opener for the first time in four years. Tim Duncan added 17 points and 11 rebounds, helping the Spurs dodge another early playoff letdown. Despite boasting the No. 1 seed again, San Antonio hadn't won a Game 1 in its last six postseason series, including the one that began a shocking first-round ouster last year. Game 2 is on Wednesday in San Antonio.